Need more information about booking Home 8511975 ? A spacious city centre apartment in Loughborough located conveniently within walking distance from the town centre restaurants, cafes, bus stops, shops, pubs, & banks. It is within 10 minutes of walking distance from the University & Radmoor College. Train station and hospital are within 1 mile. Access to villages, countryside, Leicester and Nottingham is very convenient. No matter if it’s a short stay or longer one for work, leisure, study, travel or treatments, we welcome you with open arms. Your dreamer’s delight stay will offer you the most comfortable stay while you are in Loughborough. It is decorated with love to an exceptionally high standard with a large double bedroom, separate stylish lounge/diner, fitted kitchen, three piece modern bathroom and private parking. The apartment can accommodate 2 to 3 people (depending on the make-up of the party and their sleeping arrangements). Total access to the entire apartment with full privacy. We will provide you our contact details and will be available to respond to any of your queries. We provide you with all the privacy you need for a comfortable stay. We will try to provide you very good advise on places to eat, local transport, shops, places to visit, etc. The flat is in a very safe block right in the centre of Loughborough. There is a gated entrance and a private car park for permit holders. All the local transport you need is at your door step or within 2-5 minutes walking distance. Please advise us if you need access to parking prior to your arrival as we need a refundable deposit for the parking fob, entry card and parking permit. This deposit is separate from the security deposit and must be paid prior to your arrival or at check-in. Note, the Dreamer’s Delight is a first floor level accommodation (with one-level staircase access only). Besides from the amenities listed, you will have access to fast broadband and Smart TV with High Definition Netflix subscription. A welcome pack is offered with essentials to provide home comforts and support your stay at the Dreamer’s Delight. A complimentary breakfast and other complimentary services can be offered for longer bookings (minimum 1 week). 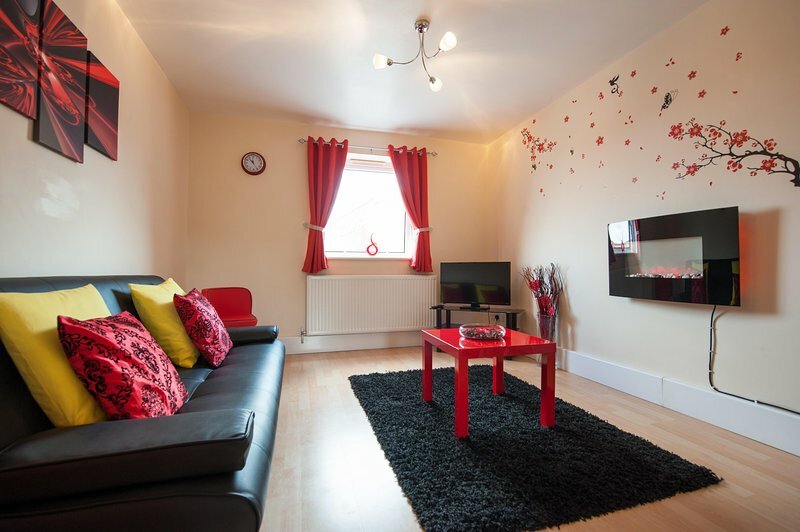 The apartment is centrally located near all the city centre amenities and the local University. - No outside / unregistered guests are permitted in the property at all times. - We operate a strict no smoking and no pets policy. - Please respect other residents in the same building. - No parties of any sort allowed in the apartment. - We would appreciate if you could please put everything back where you found them. - Please leave the apartment in a clean and tidy state as you found it at your check in. This Apartment has 1 bedroom, 1 bathroom and sleeps 4. It’s been listed on Holiday Lettings since 12 Jan 2017. Located in Leicestershire, it has 2 reviews with an overall rating of 3. The average weekly rate is £465. The Owner has a response rate of 25% and the property’s calendar was last updated on 31 Mar 2019. You can get in touch with Vishal (the owner) through the contact form on this page. Send Vishal (the owner) an email through the contact form on this page. Alternatively, if there’s a phone number on this page, you can call them. How do I contact Vishal (the owner)? If you’ve already booked, go to Manage your holiday booking to view Vishal the owner's contact details or send them a message. Or send Vishal (the owner) an enquiry through the Contact the owner/manager form if you’d like a quote or more info first. When you pay online through the Book your stay form, a booking request is sent to Vishal (the owner). You’ll find out within 24 hours whether they’ve accepted - no money will leave your account before then. You can also request a quote from Vishal (the owner) through the contact form. The owner will email you the total cost for your dates and a link to book and pay online. Use the Book your stay form to pay provisionally online. You can pay by credit/debit card or PayPal. Vishal (the owner) will have 24 hours to accept the booking and no money will leave your account before then. Why can't I call Vishal (the owner) before booking? You’ll need to contact Vishal (the owner) to do this. Send them a message in Manage your holiday booking or through the contact form on this page. You can request to change the dates or number of people on your booking via the Manage your holiday booking page. To change your holiday dates use the Edit booking button. If you need to change the number of guests staying then send Vishal (the owner) a message. If Vishal (the owner) agrees, they’ll send you a revised quote outlining the changes. You can review and accept/decline this from the Manage your holiday booking page. You’ll have 48 hours to take action before the revised quote expires.